Trabzonspor are ready to release Caleb Ekuban at the end of the season at a good price. After failing to impress at Leeds United in the English Championship, the Ghanaian forward have been impressed with the Turkish side since joining the club on loan. Top European clubs have expressed interest in the services of the striker due to his heroics. Trabzonspor, who had initially made their intentions to purchase the player outright from Leeds United after joining on loan have revealed their intentions to flog the attacker in a lucrative deal. “Our option for Ekuban is viable until the May 31,” Agaoglu said, according to NTV Spor. “We are going to use it. 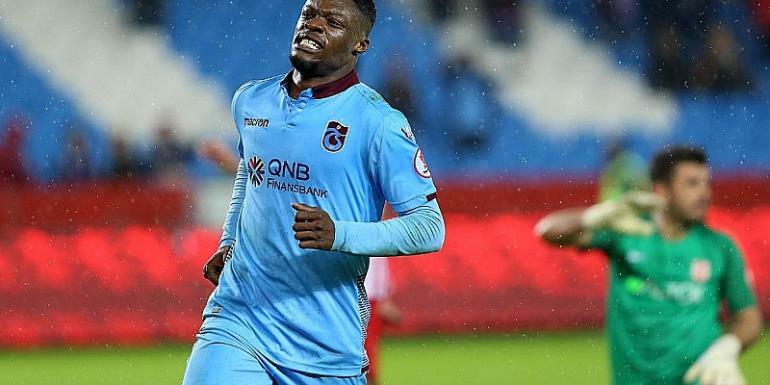 Ekuban has scored seven times for Trabzonspor in the Turkish Lig 1, making him the second top scorer for the Club so far this season after Columbian Hugo Rodallega. The Italian born forward made instant impact after scoring on his debut for the Black Stars against Kenya in the final AFCON qualifiers and against Mauritania in an international friendly.